Bangladesh Cricket Board announces strong 15-man squad for Zimbabwe ODIs. 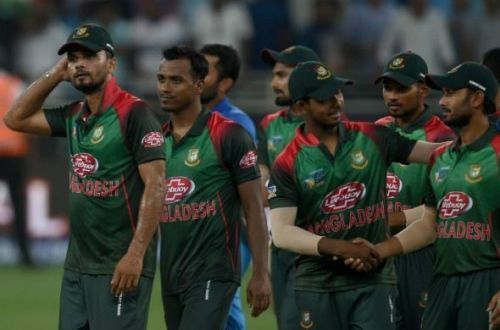 The Bangladesh Cricket Board (BCB) have announced a strong squad for the three-match ODI series against Zimbabwe which is scheduled to be played from 21 October. The team will start their preparation camp from 15 October in Dhaka. With the absence of the star-studded duo of Tamim Iqbal and Shakib Al Hasan, BCB selectors opened the door for Saif Uddin, who is all set to make a return to ODIs, and Fazle Mahmud Rabbi, who earned a maiden call to the national team after playing 68 First-class and 80 List A matches. Tamim and Shakib were left out as they are recovering from injuries. While Tamim is suffering from a blow on his left wrist, Shakib is getting treatment on his left little finger. Saif Uddin, the right-handed pace bowling all-rounder, last played for Bangladesh earlier this year. He played only three ODIs for Bangladesh but failed to impress. But, selectors gave another chance to the young lad keeping the need of a pace bowling all-rounder in the World Cup in mind. And Fazle Mahmud, the left-handed all-rounder, got the national call as a replacement of Shakib. The southpaw has been playing in the domestic circuit since 2004 but he did not get a real chance to prove himself in a great platform of the game. Fazle once was known as Chris Gayle of Bangladesh for his ability to hit sixes as the West Indian does. As the time passed by, he managed to change his style of game, learned to play big innings instead of trying to hit boundaries, and made himself compatible for a national breakthrough. While Saif Uddin and Fazle Mahmud got a chance, the left-handed top-order batsman Mominul Haque was left out by the selectors. The batsman failed to score even a fifty in his last 10 ODIs. Mominul's ODI career is now in jeopardy in spite of being an automatic choice for Tests. Soumya Sarkar, the left-handed batsman, was left out as well as he failed to draw the attention after getting a sudden call in the middle of the Asia Cup. Unlike Soumya, Imrul Kayes and Nazmul Hossain Shanto got another chance to cement their places in the Tigers' ODI set-up. BCB selectors decided to keep Mashrafe Bin Mortaza and Mushfiqur Rahim in the squad in spite of their injury concern. Both of them are recovering from blows which they have got during the Asia Cup. While Mushfiqur is recovering from a rib injury, Mashrafe's concern is over his right little finger. Ariful Haque and Abu Hider Rony remained in the squad. They were the part of Bangladesh team during the Asia Cup. While Abu Hider played a match in the tournament, Ariful did not get any chance. While the series opener will take place in Mirpur on 21 October, rest two matches will be held in Chittagong on 24 and 26 October. The Bangladesh squad for Zimbabwe ODIs: Masrafe Bin Mortaza (Captain), Litton Kumer Das, Imrul Kayes, Nazmul Hossain Shanto, Mushfiqur Rahim, Md Mithun, Mahmud Ullah, Ariful Haque, Mehidy Hasan Miraz, Mustafizur Rahman, Nazmul Islam Apu, Rubel Hossain, Abu Haider Rony, Saif Uddin and Fazle Rabbi.